2012/13 Panini Totally Certified Basketball Hobby Box mit 6 Packs a 5 Cards per Pack. 3 Autogramme & 3 Memorabilia Cards per Box ! Produktinformationen "2012/13 Panini Totally Certified Basketball Hobby Box"
Factory Sealed Topps Totally Certified Basketball Hobby Box mit 6 Packs a 5 Cards per Pack. 3 Autogramme & 3 Memorabilia Cards per Box ! Each box contains (3) Autographs and (3) Memorabilia Cards per box! Look for unique parallels featuring the popular Emerald Parallel! Find Autographed Rookie Roll Call inserts featuring 2011 and 2012 Rookie Autos! Every CASE contains (1) Totally Green Card! The pioneering Panini HRX Video Trading Cards return with new players and exciting new video footage. Featuring a fresh micro-etched pattern and a new rainbow array of parallels that stirred a set-building frenzy in 2010-11. Unique etched foil design is back with a new design twist. For all the high-end set builders out there, Totally Green sequentially numbered to five copies is back! The highly sought after one-of-one parallel also returns. Designed around the autograph to enhance the unique foil etching! Look for autographs of the game's key players! Prime memorabilia and multi-color parallels create chase opportunities for player collectors! 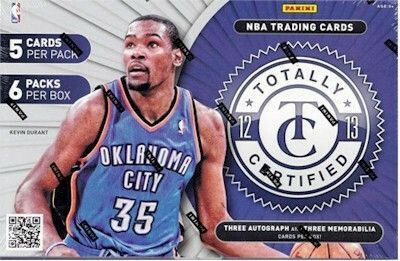 Weiterführende Links zu "2012/13 Panini Totally Certified Basketball Hobby Box"
Fanbewertungen für "2012/13 Panini Totally Certified Basketball Hobby Box"